Shinozaki Mikoto is a timid and short-statured 15-year-old high school sophomore who often gets picked on at school. The girl whom he admires, Fukazawa Yuki, happens to discover an overwhelming strength of heart behind his shy appearance. In efforts to promote the school's emergent cycling club, she introduces cycling to Mikoto and tries to talk him into joining the club, as she's thoroughly convinced he has a special inner drive that makes him a promising cyclist. How far will cycling take Mikoto, not only materialistically, but in his growth as a person? I know next to nothing about cycling, and I don't know what made me want to read this manga, but I'm very glad that I gave it a try. 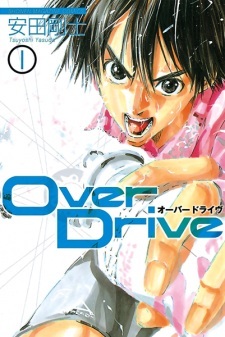 Over Drive is an under-rated sports manga that is refreshingly pragmatic. The story is fairly standard for a sports manga. The MC is an immature high-school boy who isn't very good at anything until he discovers his love for cycling. Along the way to the top, he makes his first true friends, gets closer to the girl he likes, ect. It's nothing spectacular, but Over Drive avoids the stereotypical "here comes a new challenger! Defeat him and move on!" cycle that so many other sports manga fall victim to. The pacing of the story feels natural. Races will take a few chapters. Everything else is pretty much exclusively cycling-based (practice, training), with some focus on character background. Romance/drama is minimal outside of the first few chapters (which I see as a plus). Shinozaki (our MC) is portrayed in a realistic light as well. It’s obvious from the beginning that he has a lot of potential, but he is still an amateur and he continues to struggle. This is not a character that immediately becomes the best. The same can be applied to the other characters. Although each cyclist has a “specialty”, there are no over-powered moves and there are legitimate rivals that aren’t just there to help the protagonists level up. Over Drive creates a realistic world of high-school and professional cyclists that use realistic skills. Yasuda’s art is also rather realistic and the manga contains a plethora of double-paged spreads. Backgrounds are fully-drawn and shaded. I like that the characters are mostly proportionately drawn and mostly without comical, over-the-top attributes. (There are exceptions.) The one problem that I have is that (once you get to around chapter 65 and the other rival schools are introduced) there are some characters that look very similar to each other and I mix them up. Also, some of the paneling is hard to follow. I enjoy complicated characters. Over Drive isn’t philosophic but the characters are still given an amount of background to make their motivations distinct from other characters. The dynamic between the main cyclists is comfortable but not boring. The characters are consistent and easy to empathize with. There are also 2 female characters that tag along with our 4 main cyclists. Though they take a secondary role to the males, they are integral to the story and they, too, are given distinct motivations and personalities. If you’re looking for a story that doesn’t require a lot of suspension of disbelief to follow and is reasonable with its setting and characters, Over Drive just might be the one for you. A warning though: as of now only 72/145 chapters have been translated to English. I believe there is one group that is still translating it (Shoujo Sense), but their releases have gotten very sporadic and there’s speculation that the title has been dropped. The anime has good reviews too, so if you can’t read Japanese, you might save yourself the grief and start with the show.